【Powerful Compatibility】: This obd scanner supports all OBD2 protocols car with 16 PIN interface, including KWP2000, ISO9141, J1850 VPW, J1850 PWM and CAN, it’s compatible with the vast majority of cars makes from 1996 and newer vehicles, including passenger cars, SUV, light trucks etc. It’s a plug and play check engine code reader, no need extra Battery or apps installed. 【NOT ONLY Full OBD2 Function】: Except the full 10 modes OBD2 diagnostic functions like, retrieving I/M readiness, Freeze Frame Data, read Dynamic Data stream and Vehicle Information, O2 Sensor Test, EVAP Test of Fuel Tank System (Mode 8) and Advanced On-board Monitoring (Mode 6), this new scan tool can not only reveal what error codes your car is producing, but also check the battery voltage and help to determine whether your car battery need to be replaced or not. 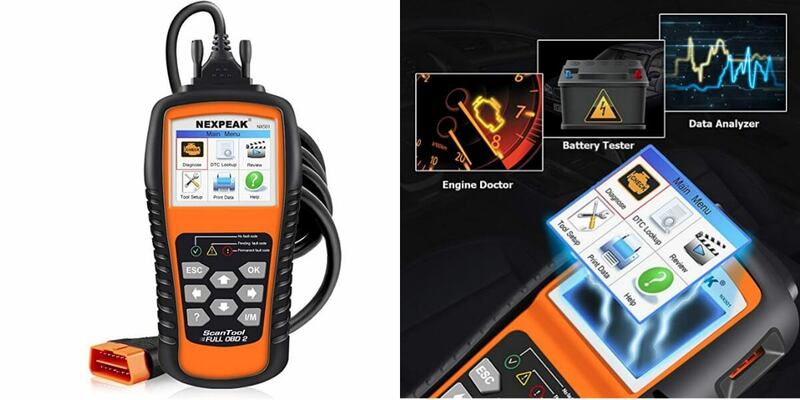 【BEST Stability and Performance】: This NX501 OBD2 scan tool does all diagnosis via 2.8’’ colorful LCD screen, features with newest software UI and best STM-32 main chip set, this car code reader can perform diagnoses 2-3 times faster than other obd2 scanner, pretty easy to navigate using the accompanying keypad. The anti-shock and slip soft silicone material and artificial mechanical design, offer you a comfortable and enjoyable diagnostic experience. 【Update & Warranty】: The NX501 vehicle code reader supports life-time free software update service, Built-in memory card allows you to store diagnostic data and print it out via computers (for Windows ONLY). The scanner comes with a portable case to easily carry /store the unit. 3 Years Warranty Guarantee with 100% refund if any issues.